I admit that I have a problem. So far I have bought two versions of the beautiful Luck Be A Lady dress from Modcloth. I love them both to bits - they fit well, look great with or without tights and cardigans, are work appropriate, come with a cute belt, and have pockets. Pockets, you guys. I wear them ALL THE TIME. They are quite pricey, so I thought I was done. The dress in 'dots', which I wear a lot to teach and work. I love that it looks like an aboriginal dot painting. 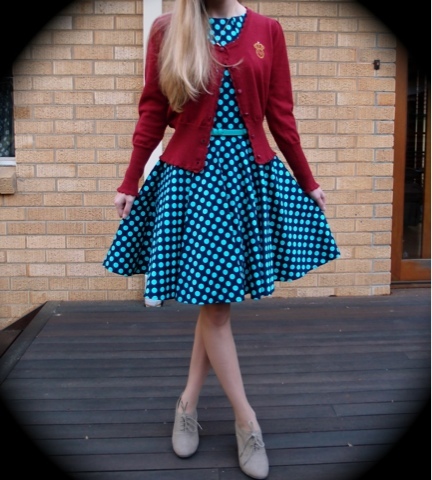 The dress in 'Blue Dots', which is now totally sold out and gone. This is more of a party dress, but super comfy and rad. 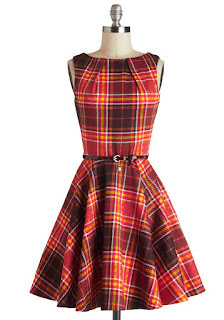 I decided to wait until I'd earned some money this year, since they didn't look like they'd sell out and ANYHOW, Modcloth usually sends me an email before things on my wishlist sell out. I did a few hours work and earned $100, then sold a dress online, so I figured I could buy them. I went online to do so! Whaaaaat. Modcloth, y u no email me? I don't want to buy just one, because it's expensive shipping and also, violet was the one I wanted MORE. Which brings me to! CAN I SEW MY OWN? I have looked on the McCall website (which has the patterns from McCall's, Vogue, Butterick, and Kwik Sew) and couldn't find anything like it with those lovely neck-pleats. The skirt part is easy enough without a pattern. I'm going to keep looking. Imagine how great it would be to be able to make my own Luck be a lady dress in whatever colour I like! More like Christina be a lady. Dress. So please fellow sewers, keep an eye out! I'm even considering unpicking one of my own to copy, and we don't want that to happen! Has this ever happened to you? What would you do in this situation? Would you just buy the one in Autumn Plaid? But you can! They ship internationally :-) Have I just caused a major problem??? Quick question! What did the tag say of manufacturer? Is it a modcloth brand? or another one. Cuz I ordered a dress from them once and when it arrived it was a jessica simpson dress. Soooo disappointed. 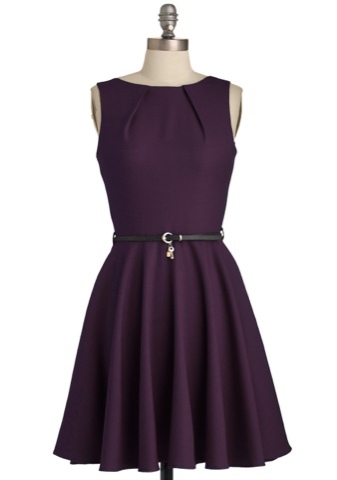 I super want to order this dress but am afraid of the same thing. What does the tag say on yours? Thanks! But it's still a gorgeous dress! Buy buy buy! I have the green and teal dresses. Have yet to wear them because I want to find other things to wear with them. Please post if you find this pattern! I too own a couple Luck Be A Lady Dresses and would LOVE to be able to sew my own. Hi Janette, I've actually found one that's pretty good - it's New Look 6184. The only real difference is that the New Look pattern has four pleats at the neckline instead of two. But it has a really similar shape, and you can make it a full skirt or a fitted skirt. I'm making it at the moment and will blog about it soon! LOVE this dress. I've been looking for a similar pattern too! Can't wait to see how your dress turns out! Did you ever find the pattern?